What’s at stake for global health R&D during WHA 69? This was the question of the moment at a World Health Assembly side event panel yesterday. 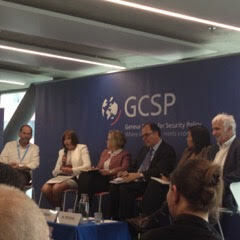 The 23 May event, co-sponsored by the Geneva Center for Security Policy and the Global Health Technologies Coalition, was held on the first day of the 23-28 May WHA. The public webcast is here. Panellists included David Kaslow, who oversees PATH’s product development partnerships; Marie-Paule Kieny, assistant director-general in charge of the Health Systems and Innovation Cluster at WHO; Suerie Moon, research director and co-chair of the Forum on Global Governance for Health at the Harvard Global Health Institute; Bernard Pécoul, who leads the Drugs for Neglected Diseases Initiative (DNDi); and Ambassador Guilherme Patriota, the deputy permanent representative of Brazil to the UN organisations in Geneva. The WHA agenda has over 75 items, many of which have implications for research and development. As Kieny said, “as soon as you talk about medicines, the issues of R&D comes forward.” But she also identified four issues which will have the biggest stakes for R&D. On Wednesday, the WHO secretariat will present member states with a report on the steps being taken to strengthen information-sharing and access to diagnostic, preventative and therapeutic products. These activities include the creation of a Global Observatory on Health R&D and the development of R&D blueprints that help prioritise and direct R&D on infectious diseases. Later in the week, a decision may be expected from member states on a draft resolution based on the recommendations of the Consultative Expert Working Group on R&D: Financing and Coordination (CEWG). A working group was expected to be set up this week, but it appears to be put off until the end of the week. The resolution’s two key proposals would expand the R&D Observatory, which is currently in trial form, and create a pooled R&D fund. However, the majority of text in the resolution has still not been discussed and agreed by members, leaving some doubt about how much progress will be made. The final two agenda items flagged by panellists are the secretariat’s annual progress report on the WHO strategy on research for health, and a report on the implementation of the Global Action Plan on Antimicrobial Resistance (AMR), which was adopted at last year’s WHA. AMR in particular is expected to grab a lot of attention ahead of the High-Level Meeting scheduled to take place at the UN General Assembly later this year. The panellists all agreed that the global health security concerns raised by AMR are lighting a new fire under R&D debates that Kieny appear to be “deadlocked”. But they disagreed over whether this is a positive thing, particularly as the security perspective is criticised by many as prioritising the needs of the global North over the global South. The principles that should and do guide medical R&D were a focus of conversation beyond the AMR issue. Moon, who is a member of the Expert Advisory Group to the UN Secretary-General’s High-Level Panel on Access to Medicines, asserted that the question of what we [the public] want out of an R&D system should be a topic of debate at the WHA. Patriota suggested that it be a topic of discussion for the CEWG. He also said AMR provides an opening for discussion of these issues. Separately, an initiative called the Global Antibiotic Research and Development (GARD) Partnership is being launched on the margin of the WHA today, at the Chateau des Penthes at 18:30. New Global Funds for R&D? Public funding for R&D is a perennial issue, but Moon pointed out that three new global funds for R&D have been proposed and are under serious consideration: one directed at neglected diseases (to be based at the Special Programme for Research and Training in Tropical Diseases [TDR] at WHO); one directed at diseases with epidemic potential; and one directed at developing new antibiotics and other antimicrobials. Assuming one or more of these funds is established, policymakers will have to take decisions about the principles that should underpin these funds. Several principles were proposed during discussion, including ethical conduct of research, open data sharing, and transparent governance. But two key themes that emerged both from the panellists and from the High-Level Panel on Access to Medicines consultations. First, affordability needs to be built into the R&D process through de-linkage or alternate funding mechanisms. Public funding is one approach, but Moon cautioned that to sustain public funding, we must ensure an adequate return on public investment. Currently, it is all too often the case that the public picks up the tab for initial R&D through public investment and later-stage R&D through exorbitant prices (the global pharmaceutical market is $1 trillion annually), while pharmaceutical companies post record profits, she said. Patriota expressed scepticism that an equitable balance between public and private R&D funding and return on investment can be reached, saying “the market doesn’t share. The market appropriates anything that is of value.” But Kaslow, Kieny, and Pécoul were more optimistic. The emphasis that panellists placed on guiding principles and rules of engagement spoke to another question asked at the top of the panel: what is the future role for WHO in R&D? The slow progress of negotiations on the CEWG draft resolution, coupled with the possible creation of new independent R&D funds, and the elevation of the AMR issue to the UN General Assembly and secretariat, has created a perception among some that we are seeing a “shift in forum” away from WHO. The panellists unanimously challenged this interpretation. Moon emphasized that the Secretary-General’s High-Level Panel is not a shift in forum but rather a “broadening of the conversation” to get other government ministries with a stake in the issue (e.g., science ministries, finance ministries) to engage. But make no mistake, she said, WHO remains the “central and essential” forum for R&D issues. More specifically, panellists stressed that WHO alone can provide the crucial normative underpinning for R&D – everything from establishing principles, to prioritising diseases, to preparing roadmaps. Pécoul seems to have captured the general sentiment when he expressed a “vote of confidence” in WHO’s ability to continue playing this role. One example of this is the soon-to-be-convened WHO Fair Pricing Forum to discuss principles and options for fair pricing of pharmaceuticals. In Kierny’s words, the aim is to challenge the idea that “the best price [for a drug] is the price that the market can bear.” The forum will focus on alleviating not only exorbitantly high pricing that limit access, but also extremely low pricing (e.g. for certain vaccines) that drives producers out of the market and results in monopolies. Initiatives like this one leverage WHO’s unique normative and convening powers, demonstrating that how the organization can contribute to the R&D agenda even apart from the outcomes of WHA 69. Mara Pillinger may be reached at info@ip-watch.ch. "Global Health R&D Under Debate At World Health Assembly" by Intellectual Property Watch is licensed under a Creative Commons Attribution-NonCommercial-ShareAlike 4.0 International License.